Always dress for the weather and your activity. For tobogganing, that means layers! 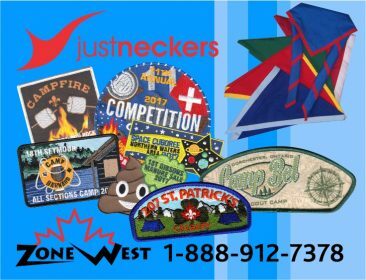 Thermal baselayers, fleece, heavy socks, winter boots, winter coat, snowpants, a toque, and gloves or mittens. 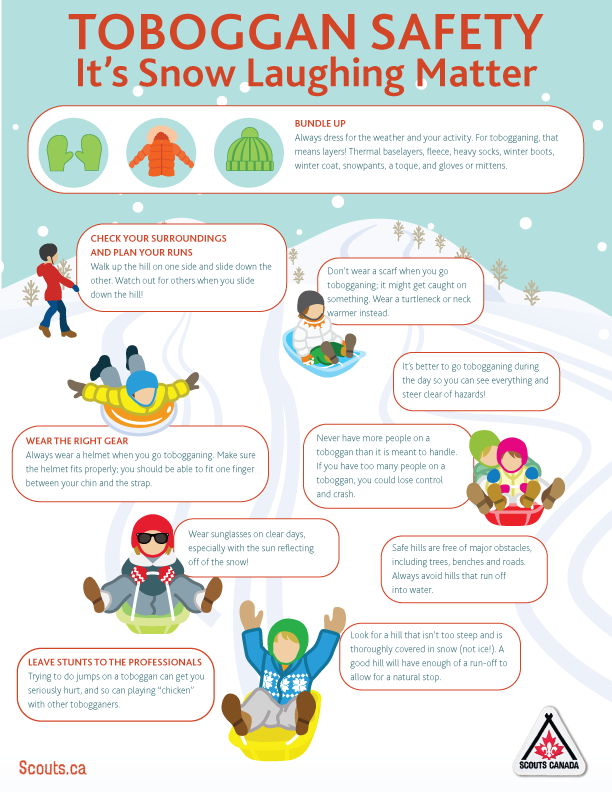 Don’t wear a scarf when you go tobogganing; it might get caught on something. Wear a turtleneck or neck warmer instead. Safe hills are free of major obstacles, including trees, benches and roads. Always avoid hills that run off into water. 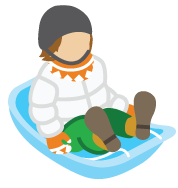 It’s better to go tobogganing during the day so you can see everything and steer clear of hazards! Always wear a helmet when you go tobogganing. Make sure the helmet fits properly; you should be able to fit one finger between your chin and the strap. Wear sunglasses on clear days, especially with the sun reflecting off of the snow! Check your surroundings and plan your runs. Walk up the hill on one side and slide down the other. Watch out for others when you slide down the hill! Look for a hill that isn’t too steep and is thoroughly covered in snow (not ice!). A good hill will have enough of a run-off to allow for a natural stop. Leave stunts to the professionals. Trying to do jumps on a toboggan can get you seriously hurt, and so can playing “chicken” with other tobogganers. Never have more people on a toboggan than it is meant to handle. 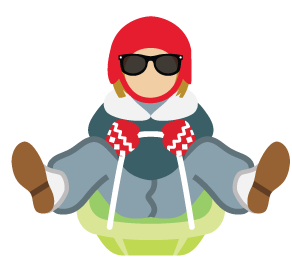 If you have too many people on a toboggan, you could lose control and crash. What an excellent resource! Love the illustrations 🙂 Well done!